Next time you’re wondering where the nearest gas station is, the answer will be just a voice command away. 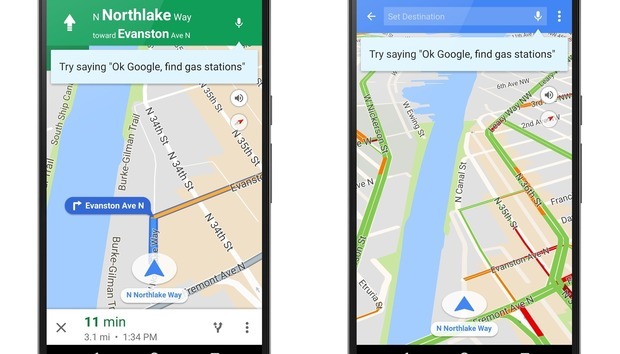 Google announced that it’s enabling a host of new voice commands in Google Maps for Android that will allow you to search for a locations, get details about your route, or even call your mother without the need to touch your phone. The impact on you: While there are many good apps to help you go hands-free, Google Maps probably dominates your usage while driving. These features will allow you to mount your phone on the dashboard or set it on the console and not need to touch it while still accessing all of the useful information. To make sure you are ready to try these out, first check that you have hands-free voice commands turned on. Head to the Google app and go to Settings > OK Google detection and enable While driving. This is rolling out on the server side, so if you don’t see it right away then be sure to check back again. Make sure you have the while driving setting turned on so you can get going with voice commands. Once this is flipped on, you’ll be able to ask Google if there are gas stations nearby, where the nearest coffee shop is, or what is the upcoming turn in your navigation route. You can also perform non-Maps related commands, like making a phone call or playing music. It brings a wider array of voice capabilities to you while you’re inside of a navigation session. Ask Google maps for gas stations during your next road trip. How do I get to [name of place]? Show me a map of [name of place].